The silnylon tarps are a special mixture of silicone and nylon. There is the strength of the nylon and the water proof capabilities of the silicone. This is one of the perfect coverings to take while camping and hiking. This light weight tarp will go into your pack and be able to deploy quickly and easily. This nylon tarp is merged with a liquid silicone on both sides. 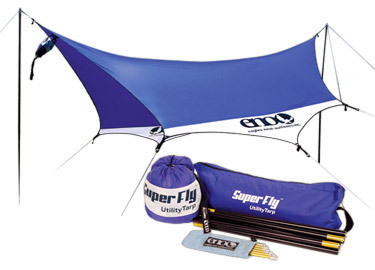 This produces a tarp that will withstand whatever you throw up against it. The grommets that most manufacturers provide along the circumference will allow for the strategic tie downs that some windy areas will require. Designed specifically for the camping that it facilitates, this type of tarp is the best choice for the many campers that are on the rails and campgrounds all year long. This 100% waterproof covering will assist is making the worst possible weather conditions at least tolerable. That is the main purpose for this tarp. Imagine being out in the rain or snow that camping will sometimes subject you to. Imagine also that the clothes you have on are already wet. The campfire is something that will help, however, without getting in out of the weather, you will be in for a wet, cold night. The silnylon tarps will help in this matter as they will keep you nice and dry so you can warm up. Now imagine that you are up on the crest of that mountain, ready for the summit and the wind picks up. It always does and then where are you without the tarp that can keep you warm and dry. This light weight combination of strength and water proofed resilience will help you prepare yourself for that last few yards. Silnylon tarps are the best quality items for the growing outdoor camping public. They have the flexibility to be all things to all people when it comes to the protection from the elements that cause campers to have a bad day. They are truly what is called for in this highly unpredictable environment. Flexibility: Climbers need flexible tarps for shading on tree branches or use a hammock. Soft texture. The silnylon tarp is soft, which makes a big difference when you are using it as a blanket cover.